Twenty-five doctoral students from around the world recently set out to forge a new path toward a theology of mission. As they blazed a new trail, they discovered the footprints of God--evidence that God was their trial guide. Charles Van Engen led this group of mission practitioners, pastors, teachers, and mission executives as they set out to discover answers to important questions, such as What is theology of mission? and What is missiology? The team used a new approach to answer these questions, employing narrative to integrate personal story, community stories, cultural stories, and biblical stories. Each writer brings his or her own unique context to bear on these important questions through personal story and by highlighting the work of a major missiologist who has impacted their life and work. By drawing from personal stories, the authors show how human factors affect missiology. 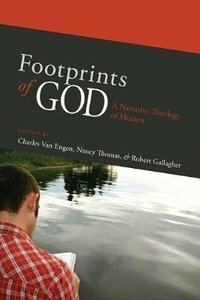 All of the chapters are set within a unique theological framework created by Charles Van Engen that focuses on mission of the way, mission in the way, and mission on the way. This framework reveals that mission must be of the way (Christ-centered), in the way (happening among the peoples and cultures of the world), and on the way (moving forward over time through God's people as they anticipate Christ's present and coming kingdom). If you are concerned about connecting the Bible, theology, and ministry with the complexity and variety of contexts facing Christians today, then you will want to join this journey to discover the footprints of God. As Van Engen says, you will be encouraged to think theologically about mission, and missiologically about theology. Chuck Van Engen (Doctorandus (1978), PhD (1981), Free University of Amsterdam) is the Arthur F. Glasser Professor of Biblical Theology of Mission and has taught in the School of Intercultural Studies since 1988. Before coming to Fuller he was a missionary in Mexico, working primarily in theological education. He also taught missiology at Western Theological Seminary in Michigan and served as president of the General Synod of the Reformed Church in America from 1998 to 1999. A prolific author, Van Engen has published many books, chapters in books, and papers. His wide-ranging publications include Communicating Gods Word in a Complex World (2003, co-authored with Daniel Shaw); Fullness of Life for All (2003, edited with Inus Daneel and Hendrik Vroom); Announcing the Kingdom: The Story of Gods Mission in the Bible (2003, co-authored with Arthur Glasser, Dean Gilliland and Shawn Redford); Evangelical Dictionary of World Missions (2000, edited with Scott Moreau and Harold Netland); and Footprints of God: A Narrative Theology of Mission (1999, edited with Nancy Thomas and Robert Gallagher).